Looking to get involved in racehorse ownership but either want fixed costs each month or a one-off cost for the season? We are able to provide fixed, variable and one-off ownerships. Meet the team, see the yard and visit the gallops in our photo gallery. Ollie has been training racehorses for over ten years, but has also experienced a number of areas of the racing industry. He was a professional jockey, with a total of 168 winners, both on the Flat and National Hunt. He gained a reputation for being a tough, powerful jockey as an apprentice and enjoyed considerable success as a professional. Perhaps the pinnacle of his achievements in the saddle came at York in 1992 when he partnered Mr Confusion to success in the John Smiths Magnet Cup. Ollie remembers the day with great fondness, riding the gelding for Steve Norton. When his riding career came to a halt due to injury, Ollie set up a pre-training yard at the family farm, breaking youngstock and teaching the basics to an average of 70 horses a year for some of the country’s leading trainers. Realising that he missed being involved on a day to day basis, Ollie decided to pursue a career in training and sought out a trainer to teach him the craft. He spent eighteen months with Howard Johnson, looking after the two-year olds (with some considerable success - the yard sent out hundreds of 2YO winners, all of which had gone through Ollie's hands), followed by periods with Dandy Nicholls, Jim Boyle in Epsom, and Michael Dickinson in Maryland, USA. 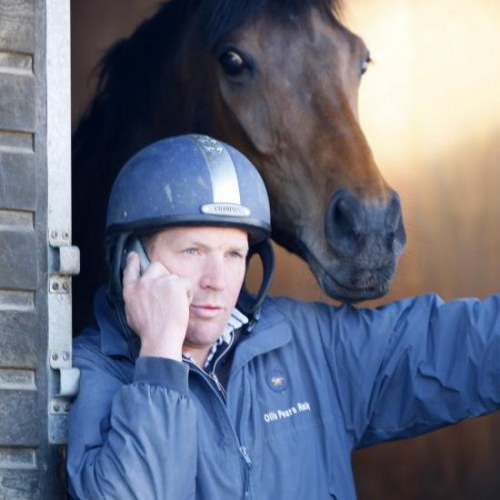 Ollie initially started Ollie Pears Racing from a mobile home on the site of a handful of rented stables, with a number of fairly moderate horses, which he placed with considerable skill to win a total of 33 races in 2008 and 2009, his first two seasons. In 2010, he was given the opportunity to buy The Old Farmhouse at Norton and consequently expanded the business to cope with demand, and to improve the quality of horses in training. He normally has 25-30 horses in training during the flat season. He now has a tally of winners heading North of 160 and is aiming to beat his riding total soon, and hit the 200 mark before 2020. Ollie enjoyed success in the Musselburgh Gold Cup with My Arch, and No Leaf Clover was placed in Listed company. Ollie and his wife Vicky are dedicated to their stables and the horses in their care, but outside racing Ollie is a keen road runner, and is a regular competitor in half marathons. Their young son Thomas is following in Ollie's footsteps and is sure to be riding ponies competitively before too long! Ollie has also ridden in the Doncaster 'Leger Legends' race for the last few years, personally helping to raise over £10,000 for the Injured Jockey's Fund.